It took me a while to publish this blog post because it didn’t seem like I did a good job describing the method. In the end I decided that poorly written post is still better than none at all – at least the information is out there and someone might find it useful. I decided to describe the full method rather than just my changes, so that people who haven’t yet started training weave entrances could benefit from it as well. This post describes using a weave channel to train both entrances and actual weaving. Please refer to previous post Training Weave Entrances to understand why I chose this method and see an example. A weave channel could be simply a set of stick-in-the-ground poles. It doesn’t need to be fancy. Start by setting up the weave channel like the blue dots on the diagram below. Note that the left line of dots always starts before the right line. This is very important. It is how the dog eventually learns to enter weaves with the first pole on his left side. The weave poles should be something like 80cm apart in the beginning. Set a reward 2-3m after the end and restrain the dog 2-3m before the weave channel (at number 6), so all he has to do is run straight to the reward. Have a party! Repeat. After a successful session at 80cm you can next time close the channel by 10cm and continue like this until you get to 50cm. Then it makes sense to start working on entrances. I train entrances in my living room using 4 poles. Train left side and right side entrances in separate sessions at first. This really made a big difference for Ruby and Java. Don’t worry, you will mix them up later. In the mean time, mix up the side on which you stand. So if you’re working entrances from 5 o’clock, sometimes stand on dog’s left side and sometimes on the right side. In the case of 5 o’clock entrance, the left side will be more difficult for the dog, so start with standing on the right side and once the dog can do it, try standing on the left as well. Don’t be afraid to start the session with a couple of easier entrances and then make them harder. But do make them harder as soon as possible. If there are no mistakes I usually make every repetition a bit harder. Since my living room is small the max starting distance to the weaves is 2m, and often only 1,5m. I think this helps because I can feel whether they are pulling toward correct entrance, but it can also be tricky. If the dog is too close then the weave channel will look very distorted compared to how it looks from 5m. Some distance building is needed once I take it outside. 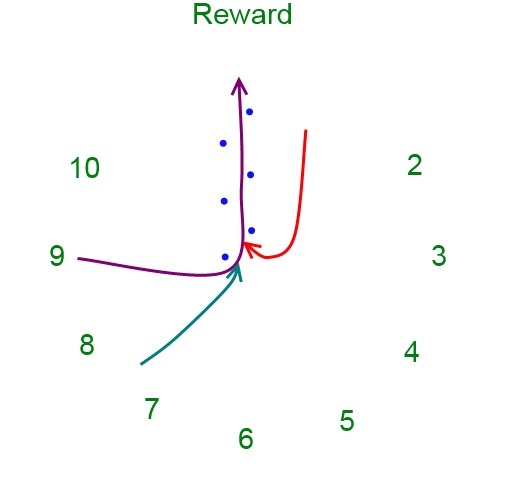 Establish a reward line, i.e. rewards should always appear in the same place (I used Manners Minder with Java, thrown toys with Ruby). Do the channel in one direction only (no running back through until the dog understands entrances). With only four poles which are widely spread out it’s easy for the dog to get confused about which way the channel is going and establishing a reward line lessens the confusion. Train in short sessions of 5-8 repetitions, first one side, a break from training, then the other side. I start with the side that caused more problems the last time and sometimes I will do two sessions on the “difficult” side to catch up with the “easy” side. Work on it every day at first, preferably 2 times per day. Since training is really short (only 20 repetitions in a day) and you’re in your living room that shouldn’t be a problem 😉 If we’re not actively training I find it useful to refresh the knowledge 1-2 times per week. In the beginning keep the channel open enough that the dog will stay in easily. When doing entrances from 3 o’clock or 9 o’clock it’s easy for dog to turn too wide when entering. Good footing is important as well (don’t do it on hardwood floor). My living room channel is 50cm wide to help Java from going out. I want her to focus on entrances first apart from staying in the channel. Reward line also helps to keep her in the channel because once she gets in it’s just a straight line to Manners Minder! When the dog can confidently do fairly difficult entrances (lets say more difficult than 8 o 4 o’clock) start mixing up left side and right side entrances. By confidently I mean he will nail every entrance in a session, even if the first one you do is already at 4 o’clock. Perhaps do two entrances from 5 o’clock, two from 7 o’clock, two from 4 o’clock and two from 8 o’clock. If the dog is not successful, make the entrances easier and work more on the side that gives him more problems. Sometimes you will find that the dog is not yet confident with entrances on one side, so you will need to go back to work only that side. Don’t let the dog pattern by repeating mistakes. If dog makes two mistakes in a row make it easier (and then even easier) until they succeed. Keep the success rate high. Do restrain and feel where the dog is pulling. Let go when they’re pulling toward the correct entrance. Don’t help the dog with motion (unless he’s really stuck). It often takes the most work to get from straight entrances to 7 o’clock and 5 o’clock and again around 9 o’clock / 3 o’clock. Be patient, move in small increments and set up for success. If the dog is stuck you can help them by shaping their path a little: as you release move with your dog for one step so that he nails the entrance. Do this twice, then check if he can do it on his own, without your movement. After a difficult session end with an easy entrance. This is a common psychology trick that works on humans, too. It makes the student feel like this stuff is easy, like they know how to do it. Success is good for confidence and confidence is good for learning. Have a question? Don’t be afraid to ask! I’m sure I haven’t covered everything. Next time we’ll look at transferring this knowledge to a set of 12 weave poles. Thanks for this!!!! I was thinking I needed to make the poles less wide for her to get the entrances but was waiting for the break to be over to ask Silvia how wide exactly! You just solved that one! Thanks so much for writing this- I might get 4 or 6 of my weave set from my agility field and set it up in my yard so I can train whenever I want without having to go anywhere. I so want Lu to have awesome weaves! You’re welcome 🙂 Yeah it seems that they get entrances easier if the channel is 50cm or less. I would say body width is ideal, but then they also have to work on staying in and I don’t like that in the beginning stages. It really helps if you’re able to do several short sessions in a day instead of one longer, so if you can do it in your backyard, go for it! Good aim is often half the training 😉 Another thing you can try is use food bowl and put one treat in it, then add extra if she nails the entrance. That way she doesn’t have to wait for you to open the pouch. Ruby likes this option a lot. So yesterday morning I went- weaves set at 50cmish, 8 of them total. I decided that I was still having no progress with the thrown ball and we weren’t getting anywhere… So, I did what we do best- I shaped an entrance (on the left). Once she had the hang of that, I put some food in a bowl at the end of the weaves – I know she doesn’t DRIVE to food in bowls but I figured it was worth a shot… anyway, she drove INTO the poles (not out of them) and we started nailing entries. From fairly close at first, with more and more angles… When I tried again that afternoon, we were easily going all the way around, first on left, then a break (and some serpentines) then the right side…. and it was easy! In fact, after yesterday morning’s session when she mucked up one entry (and because I didn’t click she paused, looked at me, and didn’t go get the food), I think every one has been perfect. No popping out the other side either, which she was doing! This afternoon I used her favourite treat-pouch-tug-toy at the end instead and I had much better drive out, and then I even started her over a bar to get more speed in and she did it. I’m so, so excited. I think it was partly your suggestions and also party ditching the thrown toy for now- it made her so focused on getting the toy that she forgot about her job, I think (the job was getting the toy, rather than doing the weaves properly). So, now thinking about that, I wonder how it will go teaching running contacts. I may have to rethink how I begin training it- maybe running through a straight tunnel to a dead toy first or something… I’ll have to ask Silvia. I don’t worry about speed much in the beginning, but I do try to get it (by throwing a toy) once they understand entrances. Yes, if you can mix the entrances from both sides up to 90 degrees (3/9 o’clock) and from at least 3m then definitely make the channel more narrow, since she needs to learn to stay in the channel once she hits the entrance. Java’s channel is about 30cm wide now and she is starting to pop out sometimes because she doesn’t turn sharply enough. I know! Sort of like how when we started to do the extension/collection stuff she suddenly went: Ohhhh, you wanted this FAST??? Well duh, I can do that. I think the speed is definitely there and I threw the toy pouch on the last try because she’d begun to look back at me instead of pouncing the toy, so I might mix it up a bit like that. I’ll try for a video this weekend- it was raining too much tonight and my camera wouldn’t appreciate being out in it, and I lent it to a friend this evening anyway.. By the weekend the entrances should be super awesome anyway. 😉 Cool, tomorrow I might try mixing up some sends to the entrances from both sides of me (though here in Aus, a ‘flick’ is a big no-no, whatevs.) and increasing the distance, maybe using a jump to help her drive. Yeah, by the rate she’s going that video is going to be A.M.A.Z.I.N.G! If you start her on the other side of you, do a rear cross before weaves – that’s what this set up is for, not for flicking 🙂 Though of course flicking is perfectly legal here. I live in Slovenia. Are you coming to LoLaBuLand? And who knows, by the weekend it might have all fallen apart again by then, haha! Though I’m thinking I MIGHT (might!!!) have a serp with a straight line of jumps… MAYBE! It’s the last one that’s causing us trouble but we’re so, so close. We’re coming to Slovenia!! (it’ll be my 2nd time, but the first with Nic) I haven’t actually told Silvia I’m coming (working up the courage and also not wanting to look like a freaky stalker lady) though I don’t know if she has camps or anything on (if she does I might have to change my plans a bit, hahaha!! though of course I can’t have my dog with me), I was just planning on going to the trial in Hrusica/Jesenice..
Wow, a straight line of serps would be great as well!